The offshore gas field is located 190 km from the Burrup Peninsula in Western Australia. The first phase of the Gas Development Project involved the construction of a Liquefied Natural Gas (LNG) Plant and its utilities, located on the Burrup Peninsula. The feed gas to the onshore gas plant is supplied by the Riser Offshore platform via a carbon steel trunk line. The Riser Offshore platform is unmanned but monitored from the onshore gas plant. Removing immiscible Hydrocarbons from the containment water was a major issue in the project. The oily water varies between 100% oil and 100% water. An average volume of 500 litres of oil is generated each day on the surface of the water containment tanks. This oil must be removed to acceptable levels to enable the water to be discharged into the main Treatment Plant. Two Skim-Pak, model 18500-SH Skimmer Systems were specifically designed to ensure reliable, continuous, performance in the containment tanks. This dependable, uncomplicated system removes floating oil from the water surface at skim depths from 3mm to over 500mm. There is virtually no maintenance or monitoring required and the skimmer’s performance is minimally affected by turbulence. The 18500-SH, with flow-controlled weir is designed to remove 100% of the surface oil. In the tank, the skimmer head follows the water level removing accumulated floating oil on demand. 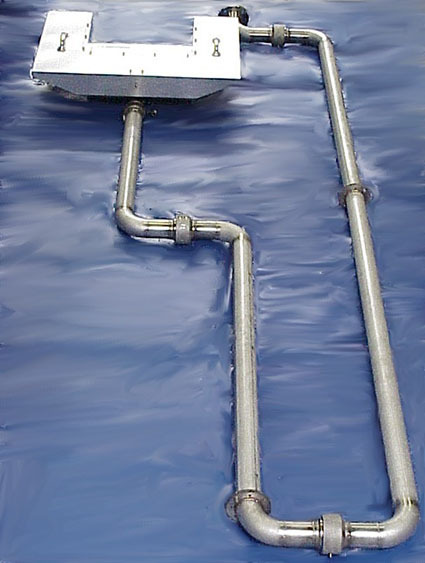 Designed with virtually no moving parts, the 18500-SH Skimmer system in this installation works by gravity flow. Skim-Pak Floating Skimmer Systems have been operating successfully for approximately 20 years, requiring only minimal maintenance over this time. Baldwin Industrial Systems P/L is the exclusive Australian fabricator and distributor for Skim-Pak, who supply a large range of surface skimmers and decanters in the USA.